I’ve always thought that real-time strategy games were a perfect fit on iOS devices. While we’ve had our share of decent hits, I’ve always felt that a lot of them still felt restrained by the ‘mobile’ category – cutting out certain features in the interest of quickness or portability. Autumn Dynasty ($6.99) practices very little of this philosophy. It combines a mostly complete repertoire of RTS staples with stunning visuals and workable multiplayer. Oh yeah, and it plays well too, making it one of the better RTS titles on the market. The most impressive thing you’ll notice about Autumn Dynasty is its phenomenal visuals. Utilizing a hand-drawn “paint stroke” style a la Mikado Defenders ($2.99), Autumn Dynasty elicits heavy themes of classical Asian culture which can be seen in everything from the well-done cut scene portraits to the way unit movement arrows mimic calligraphy strokes. Even secondary elements like the environmental backdrops and menus look detailed. It’s a unique style that makes you feel like you’re in an interactive storybook if done correctly, and Autumn Dynasty nails it expertly. Visuals are all well and good, but Autumn Dynasty also shines in its mechanics. Simply put, this is one of the most full-featured RTS titles I’ve ever played. There’s resource management (in gold and acumen), unit training and even building construction (restricted to pre-determined build locations). 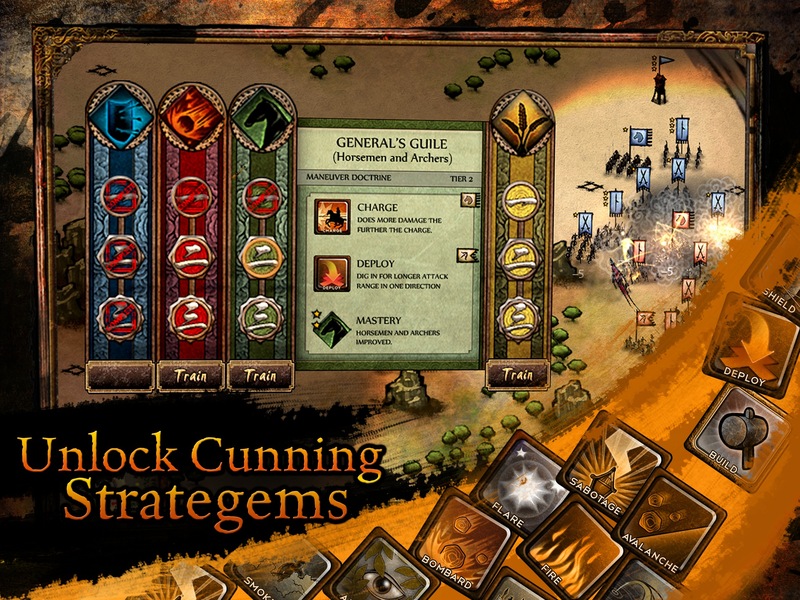 Each unit also has a multitude of abilities that are unlocked as you progress through the campaign. There are even environmental considerations, such as forests that hide your units and elevation advantages. I was impressed at how well all the elements in Autumn Dynasty seemed to complement, imparting a certain amount of freedom to play that is sometimes missing from other mobile RTS titles. You’re going to need this freedom too as Autumn Dynasty’s campaign isn’t a walk in the park. Following the tale of a government official investigating a rebellion, you’ll encounter missions that range from limited unit engagements to stealth missions to the standard base/army buildup. You’ll notice early on that the difficulty curve ramps up relatively quickly to the point of requiring precision, even on the ‘Normal’ difficulty. However, I didn’t find it particularly onerous, and an even easier difficulty is currently in the works. Controls are always an important element for RTS titles, and I think Dynasty does a pretty decent job. 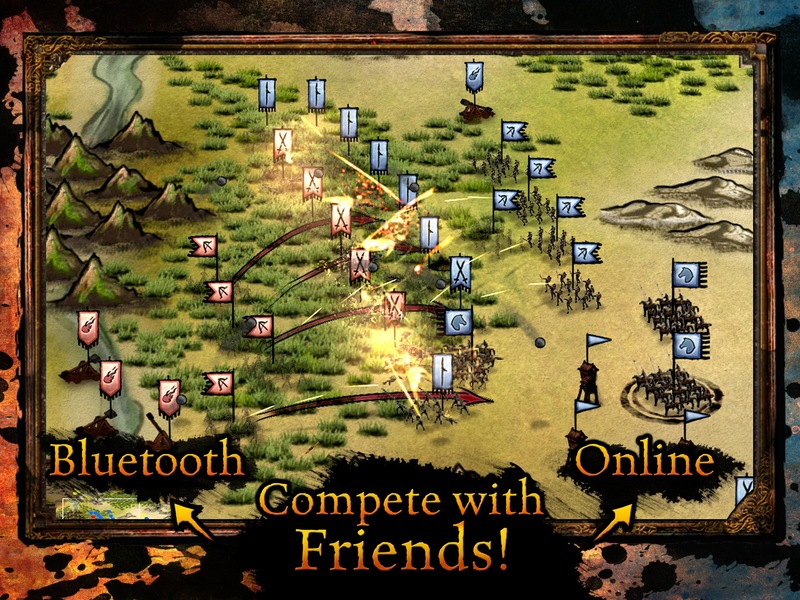 Players either tap on individual units or draw circles around groups to select. Movement and attacking are as simple as drawing a line from the units to the location you want them to move to (or attack). Dynasty lacks some of the advanced unit controls such as custom-defined groups, but overall I had little issue with getting my army to do what I wanted it to do. Special mention needs to be made of the game’s Skirmish mode, which is an entirely different experience altogether. Forgoing any semblance of narrative, skirmish puts you against the AI on a balance map with the goal simply to take out the opposing force. What makes skirmish unique is the fact that in addition to all the campaign features, a research tree is introduced which adds a final overarching tactic. All the unit abilities used during the campaign are initially locked and must be researched. There are four different branches to research, and only one can be researched at any time. Whether you choose to focus on unlocking abilities for a certain unit or improve the efficiencies of your buildings, there’s a lot of gameplay variety. Autumn Dynasty also throws in a good variety of maps and forces you to play through each one to unlock the next, giving a sense of progression even in this mode. On top of everything discussed above, Autumn Dynasty’s icing on the cake is the inclusion of multiplayer. Offering both Bluetooth and Game Center matchmaking, Dynasty’s multiplayer focuses on the above mentioned skirmish mode. As much as I enjoyed the single player exploits, taking all those strategy elements and throwing in a human player just makes the experience that much more deep. Add in voice chat and a smooth joining experience, and I’m thoroughly impressed with the game’s multiplayer offerings. There are a few elements that keep Autumn Dynasty from pure perfection. The most significant omission is the lack of a save system. True, most early campaign missions don’t take particularly long to accomplish, but later levels that incorporate multiple objectives could really use at the very least some kind of checkpoint system. I was also a bit disappointed at the lack any kind of manual, as the game is certainly deep enough to warrant one. Another nagging issue is the current lack of multiplayer leaderboards (which apparently will be turned on relatively soon). Regardless, Autumn Dynasty is an excellent RTS experience and should not be missed. 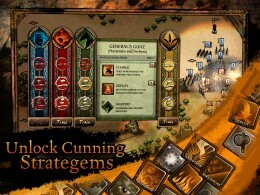 This is one of the few iOS titles that really does not skimp on any of the features that make RTS games exciting. When you add in the beautiful visuals and multiplayer, it’s a no brainer that anyone with even a remote interest in strategy games needs to pick up. 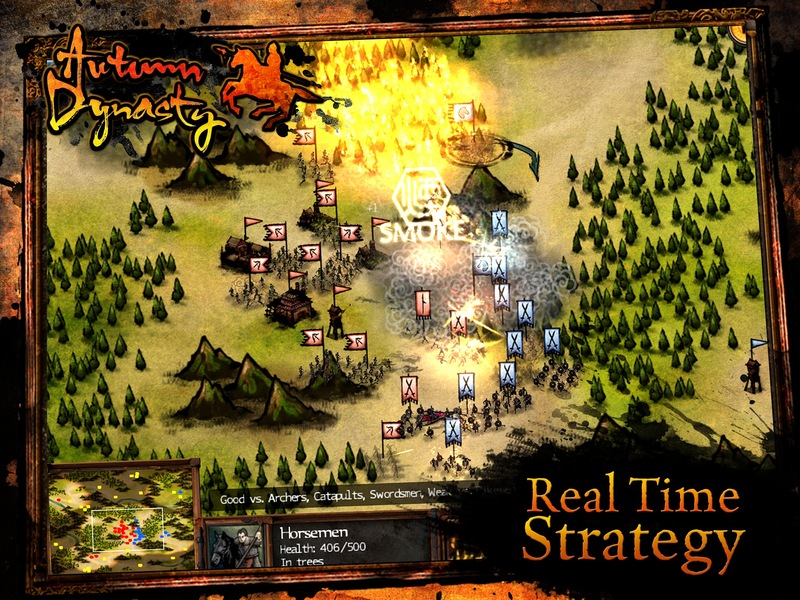 Real time strategy wargaming for iOS: Autumn Dynasty is now universal!